LINDSAY MURDOCH. 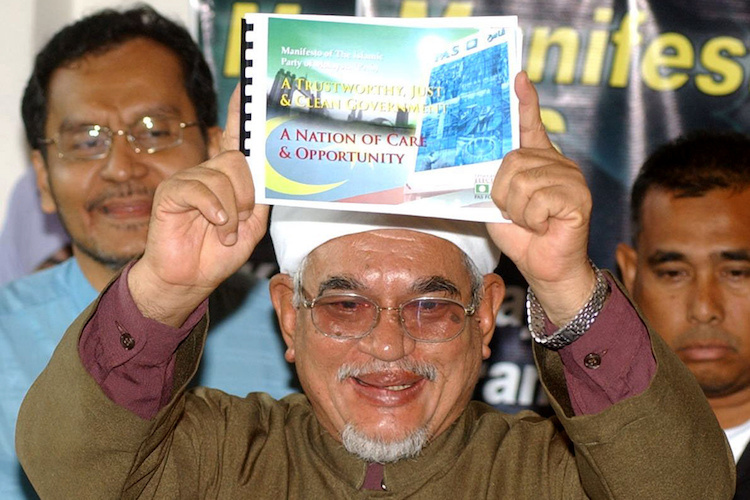 Former Islamic cleric could be Malaysia’s kingmaker. Unlikely election alliance between PAS and UMNO could result in the country taking a stronger Islamic direction. While the battle for votes in Malaysia’s fiercely fought general election campaign has largely focused on Prime Minister Najib Razak and his now archenemy and opposition leader Mahathir Mohamad, a one-time fiery Islamic cleric has emerged as a possible kingmaker. Abdul Hadi Awang has aligned his one million-member Malaysian Islamic Party (PAS) with Najib’s United Malays National Organisation (UMNO), an alliance that could steer the country toward a stronger Islamic agenda. Just as no one in their wildest dreams could have imagined Pakatan Harapan opposition coalition chairman Mahathir and his former nemesis Anwar Ibrahim contesting the election as allies on May 9, a joint opposition ticket between Najib and Hadi is almost as surprising. For decades UMNO and PAS, the two biggest Malay parties, were bitter rivals, seeking to mobilize the mass Malay vote at successive elections. As a trim young Islamic cleric with a long black beard and white robes almost 40 years ago, Saudi-educated Hadi made fiery speeches denouncing UMNO, the party that has ruled since independence. But 70-year-old Hadi, a tuan guru (master teacher) with two wives and 14 children, has been playing political footsie with Najib since PAS split with a three-party opposition alliance in 2015 over a series of policy disputes as the party pushed for punishments under Islamic law in Kelantan state. Since the 1980s, when religious clerics took control of PAS, the party has had limited success trying to promote its religious agenda as an alternative to UMNO despite it being Malaysia’s second-largest party by membership. It holds only 13 seats in the 222-seat parliament after losing eight seats to defections in the last four years. Hadi has told supporters the party aims to win enough seats on May 9 to seize power in its own right. “We either want to form the government or we want to join the government that is formed,” he said. However, PAS has never come to power through national elections and analysts say that rather than being able to win a majority of parliamentary seats, the party will act as a spoiler, causing a large number of three-cornered fights that are likely to favor UMNO, especially in seats where majorities are thin. Even before campaigning officially got underway, Mahathir was taking aim at Hadi, saying the cleric had zero political knowledge and was unfit to lead any government. “He should not have joined politics in the first place. He should be an ustaz (scholar) at some kampung. [This would] suit him well,” Mahathir said. Whether any formal deal has been struck between Hadi and Najib ahead of the election is unknown publicly. But Clive Kessler, an expert on Malaysian politics from the University of New South Wales in Australia, says the old adversaries are changing Malaysia’s political landscape through their complicit partnership, with a new Malay duopoly taking shape. “The UMNO-PAS consortium sees the PAS not just reborn and strengthened but in a very serious policy and political sense in control,” he said. Hadi was quoted in February as saying that if PAS comes to power, non-Muslims would have only a secondary role in government, with Muslims in cabinet setting policy direction while non-Muslim ministers would only be tasked with carrying out what had been decided. “IF PAS rules, [the administration] will be divided into two. One, a cabinet that decides on national policies. This must consist of people who adopt the national ideology and faith,” he said. Hadi said if Malaysians better understood hudud, the Islamic criminal code that includes amputations for thieves, they would choose it over civil law because it was a fair system. “If there is hudud, it will follow what is already provided in the federal constitution or state enactments,” he said. Kessler, the university’s emeritus professor of sociology and anthropology, said he expects that laws strengthening Islamic powers and penalties will be introduced in Malaysia “at some hardly remote time” after the election. “We have been witnessing the slow but seemingly irreversible desecularization of Malaysian society since the mid-1980s, all under Islamic auspices, including legal and judicial matters,” he said. Joseph Chin Yong Liow, dean of the S. Rajaratnam School of International Studies at Nanyang Technological University in Singapore, said PAS had been trying to advance its religious agenda as an alternative to UMNO since the early 1980s when the party fell into the hands of religious clerics. It has enjoyed only limited success, with the possible exception of its Kelantan stronghold, he said. “In fact, the PAS record is telling of a rather curious anomaly: electorally, PAS has been most successful when it worked in coalition with non-Malay parties,” Liow said. The party leadership has already announced its intention to contest more than 130 seats, even more than UMNO, leading to many three-cornered fights. Article first published in UCA News on 15th of April, 2018. Lindsay Murdoch is a veteran journalist and commentator who has lived in Southeast Asia for 30 years.